The OFFICIAL IOL app at your fingertips. 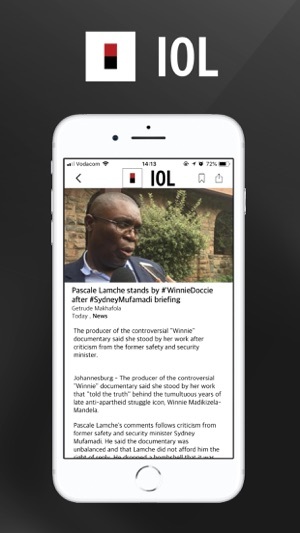 The IOL app represents the very best in traditional and digital journalism, with breaking news from South Africa and the rest of world and in-depth quality reporting from over 20 of the most trusted newspaper brands across South Africa. 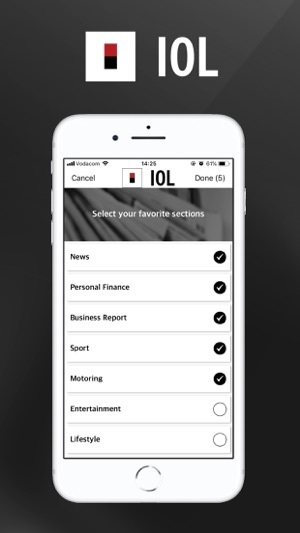 The IOL app also offers the latest Sports news and results, Entertainment, Lifestyle and Travel coverage as well as everything you need to know from the world of Motoring. 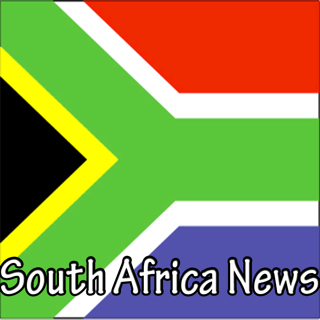 You will also have access to news and opinion from Business Report, SA's most widely read financial newspaper, as well as Personal Finance, which tackles issues affecting the pockets of everyone. All this is available to our app users any time of the day, any day of the week. 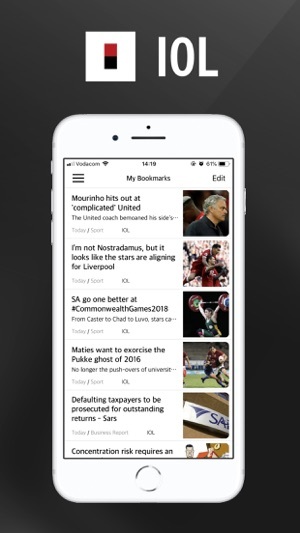 With access to some of Independent Media's top newspaper brands, the app allows you to stay informed with content that ranges from breaking news to in-depth quality reporting and from light-hearted stories to thought-provoking opinion and analysis. 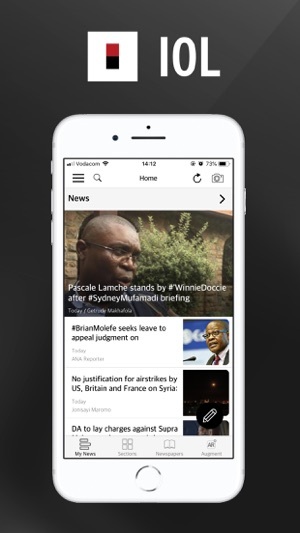 The new revamped IOL News App is a result of feedback from numerous user groups, user experience specialists and analytics gathered so that news is offered according to your interests. User Generated Content: Over and above our quality news coverage, we invite you contribute your news coverage that happens in your neighbourhood and to share your stories, that will allow us to publish to the +/- 3 million readers we have - every month. Find this feature under our “user generated content” section. Personalisation: You can set your preferences to show you only what you’re interested in. For example, if you only like to read about Sports and Business, then you have the option to tailor your feed accordingly. If you like Entertainment, Lifestyle and Politics, then you too can filter out the rest by setting your feed. Augmented Reality: In keeping with digital developments, we added the option for you to experience augmented reality at your fingertips. Look for this option within the app and explore another aspect of digital coverage. Subscription: Most of our content is available to you for free, because we'd like you to visit us a lot. However, if you subscribe you will have full access to all the content in our newspapers. Subscribers also have access to PDFs and classifieds. 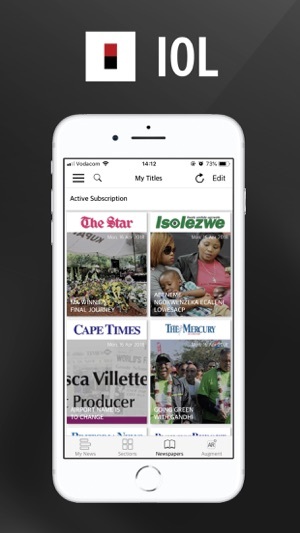 You can manage your subscription by accessing your "Account & Subscriptions” within the IOL app. IOL, Why bother to make an app for IOS if you can’t get it right. This is THE worst news app. It loads very slowly, every time, and is very unstable. It is much better to open IOL in a browser if you actually want to read the news. FYI, I am using an iPhone X and an iPad Air2. Come on guys, I am sure that you can do better than this with a little effort. Not sure that the developers are even interested in what we write in the reviews there has been no improvement at all!!!! just downloaded the update. no improvement in fact maybe more glitchy on iPhone X, than before. Now you expect people for this useless app? Why would anyone want to pay for this offering. I have now deleted this app. Are you people really serious, such a glitchy and horrible app and you think I am going to pay for this. Well I have now removed the app from all my Apple devices, I would Never pay for this crummy app, advertising and all. Ok so I download the app, and do that. All I get is an advert. For a marathon I’m not going to enter. I mean I don’t care about road running AT ALL. Instead of promised content, I get spammed.